Start Making Kombucha at Home With This DIY Kit — on Sale Now! Take a stroll through any supermarket, cafe or Instagram feed and you’ll quickly notice that it’s all about kombucha these days! People everywhere are raving about kombucha’s health benefits, but not as many are thrilled about the damage the tasty drink is doing to their wallet. If you buy kombucha on a regular basis, you know exactly what we’re talking about. That’s why this Brew Your Own Kombucha Kit is the answer to our probiotic-loving prayers. 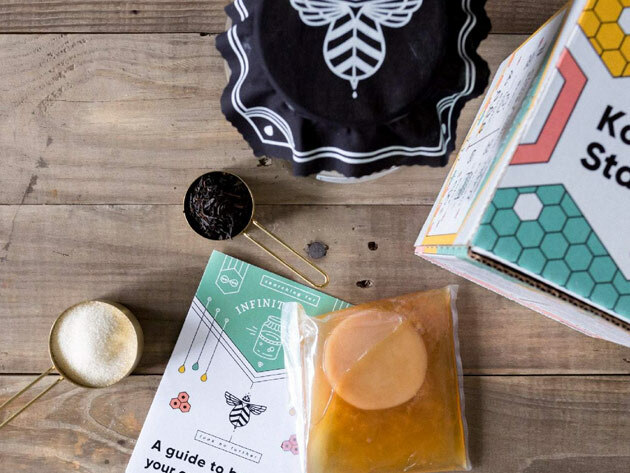 This handy little kit includes everything you’d possibly need to brew your very own kombucha. All that’s required is a process of four easy steps, and in two weeks — bam! You’ve got some delicious gut-healthy tea right at your fingertips. You can even experiment with different flavors by adding fruit and herbs, creating delicious kombucha you couldn’t necessarily find at Whole Foods or other kombucha-loving markets. You can get your own kit for just $40 — which is a great investment in a lifetime of kombucha. And for those of us that are just hopping onto the kombucha train, there are actual reasons why this drink is so popular among the health conscious folk out there. Kombucha tea contains something called SCOBY which stands for symbiotic culture of bacteria and yeast. The SCOBY is responsible for the fermentation process that occurs during the brewing of kombucha and provides drinkers with a myriad of health benefits. Yeah, SCOBY may look kind of gross, but trust us, it’s full of some pretty amazing stuff! Just check out the many great benefits kombucha has to offer. See It: Grab the Brew Your Own Kombucha Kit for just $40 now! When waiting for kombucha to ferment over a period of weeks, bacteria and yeast develop. This SCOBY, as we mentioned before, is full of probiotics. Probiotics are chock-full of healthy bacteria that when ingested are said to aid with digestion, inflammation, liver function and in some cases, weight loss. If you have general tummy problems, taking probiotics can help regulate your digestive system. Thanks, kombucha! Does it seem like you come down with a cold every other month? Kombucha to the rescue! The fermented tea drink has been known to support the immune system naturally thanks to being rich in antioxidants. The antioxidants in kombucha contain a compound known as DSL that unfermented teas don’t typically have. DSL is great for detoxifying cells, helping your body to stay strong and fight against illness. Let’s just say you’ll get a lot of use out of your Brew Your Own Kombucha Kit come flu season. It makes a great soda replacement. Habits are hard to break, and if you’re an avid soda drinker, you definitely know this to be true. Kombucha tastes great and it’s a fabulous option if you’re sick and tired of sipping on ice water with lemon. And thanks to its fermentation process, it actually has carbonation which makes it a great alternative to soda. And the fact that it has very little sugar and no artificial sweeteners make it a super healthy drink choice. It can help to detoxify your liver. After one too many girls’ nights, your liver could probably use a break. Try swapping out your vodka sodas for delicious kombucha! Thanks to the tea’s gluconic acid, toxins can more easily be expelled from the body. This acid also regulates the liver’s detoxifying process, letting your body get rid of toxins more efficiently than ever. And with an at-home kombucha kit, you’ll be able to detoxify your body whenever you see fit — especially after the bachelorette party you have coming up next month. It can give you a healthy energy jolt. Picture this: it’s 4 PM and you’re in a boring work meeting. You could really use an energy boost but if you drink another cup of coffee, you’ll jitter yourself right out of your seat. Sound familiar? Instead of loading up on coffee and other caffeinated drinks, try sipping on some kombucha. Yes, the fermented tea drink does have traces of caffeine, but its energy-giving power actually lies in its iron and vitamin B. When elements are ingested, the hemoglobin in your blood grows, giving you a healthy flow of oxygen. You’ll feel a natural, healthy energy as opposed to the jittery, stomach-turning kind that coffee often leaves you with. By brewing your own kombucha to drink on the regular, you’ll maintain great cellular health and immunity. That’s because of the many anti-microbial properties present in kombucha. Combine that with the drink’s detoxifying abilities and you’ve got yourself one tough body ready to fight anything that comes its way. So what are you waiting for? Start taking your health into your own hands and enjoy delicious, benefit-rich kombucha at home today! This Brew Your Own Kombucha Kit is just $40 which is way less than you’d spend on individual bottles at the store. Just sayin’.